When an e-mail popped into my box inviting me to dine at Jam Jar, one of the restaurants from my ever growing "list", I didn't even need to think about my answer. Whilst I am working hard to tick everywhere off the list, it's nice when something comes up that gives me that extra little nudge in the right direction. Jam Jar opened last year in Jesmond, a trendy suburb of Newcastle famous for its student residents and an ever growing collection of restaurants, bars and coffee shops. They have recently recruited a new head chef, Steven Foister, a local lad with an impressive CV including favourites Café 21 and The Cherry Tree. 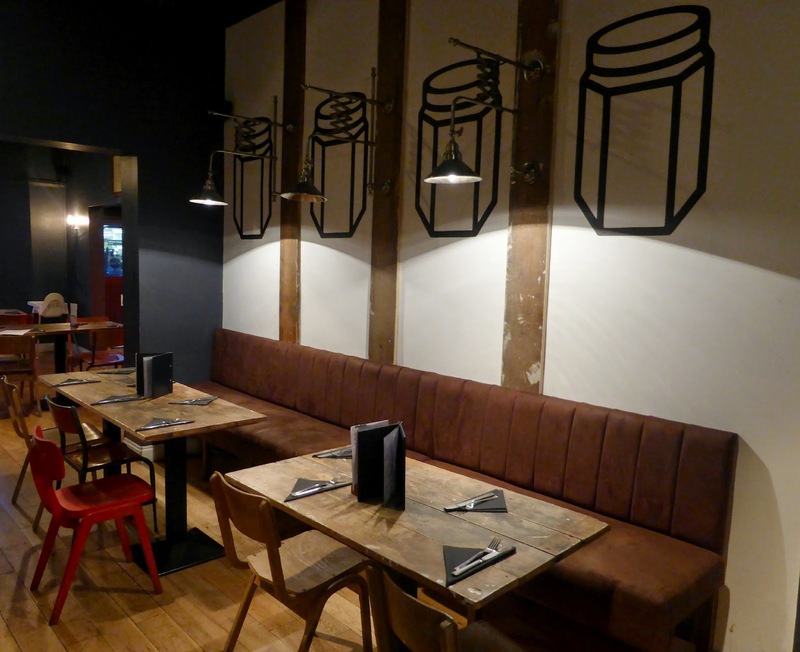 Steven's mission is to develop the menu at Jam Jar to offer American comfort food and English classics as well as bar snacks and freshly made desserts. Walking into Jam Jar I loved the place immediately. It's quirky with loads to look at yet feels homely and comfortable. 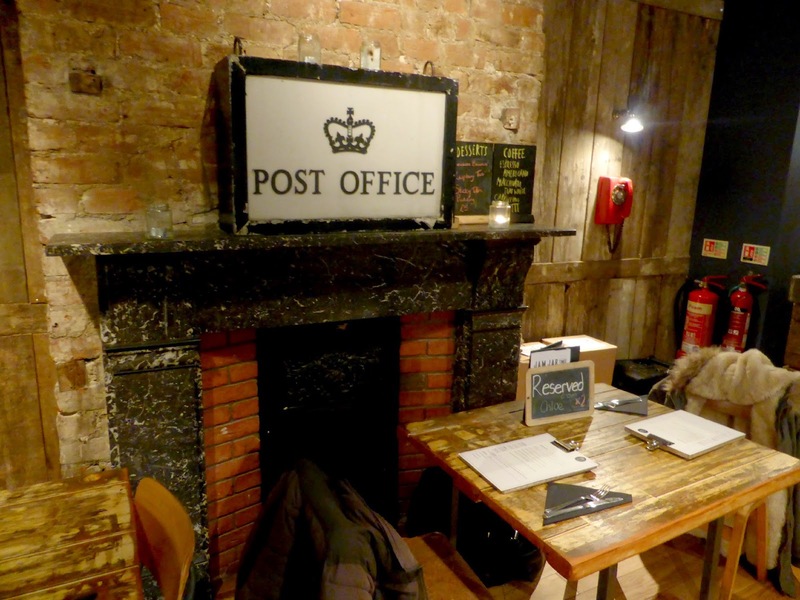 I loved the wooden tables, brick fire place and the jam jar wallpaper. It was a great place for a romantic date or a cosy catch up with friends. The restaurant is kept fairly dark in the evening but is lit up with lots of beautiful candles and the welcoming red glow from a large neon jar that hangs above the bar. The restaurant was busy, with every table reserved or full of happy diners. 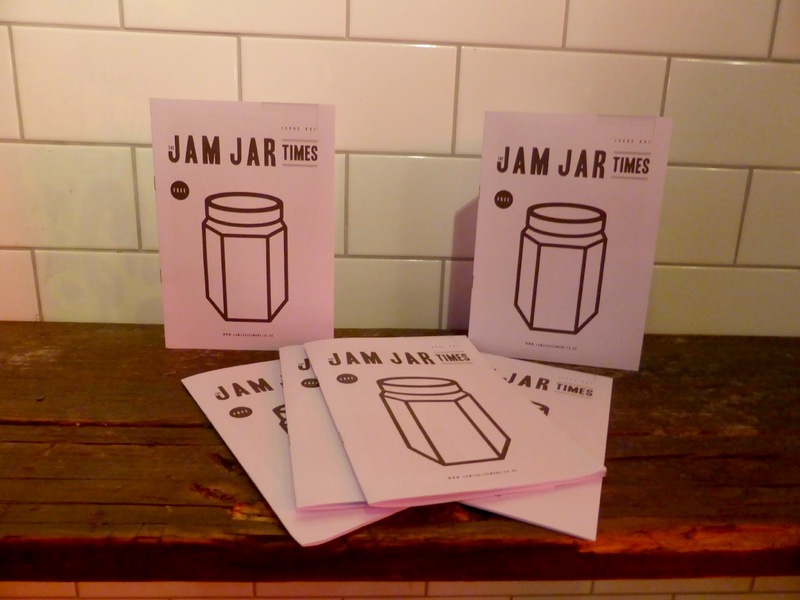 Jam Jar is hugely popular and we loved the atmosphere. Three days of the week there are exciting offers. Every Tuesday is "Shrove Tuesday" with buy one get one free on pancakes and "Burger Tuesday" with 2 burgers and 2 fries for £14.00. Wednesday is "Supper Club" which offers 2 courses for £9.95 or 3 courses for £12.95. Sunday is Quiz and Curry night with curry of the day costing only £6.00. We dined on "Supper Club" day, but decided not to order from the menu as the alternative Sandwich menu we were handed was too good to ignore. Simon chose the Jam Burger with fries - a burger served with crispy bacon, smoked cheddar sauce and tomato jam. It was beautifully presented and made my mouth water as soon as it was put down in front of him. Being a fully loaded burger he did find it a little awkward to eat, full of liquid the bottom bun was very soggy so he ended up eating it upside down. He wolfed it down though and said it tasted amazing. As this isn't "Bake Off" I guess a soggy bottom doesn't really matter. I ordered the Pulled Pork Sandwich with sweet potato fries- BBQ pulled pork served with baby gem lettuce, shallots, Swiss cheese and apple. My sandwich was full of flavours and so delicious. Again it was so packed with filling it was hard to eat without making a mess. Luckily I think half the fun of eating yummy food is to make a huge mess. We were so full after our huge sandwiches but I knew I couldn't leave without trying one of the desserts, so I picked the Raspberry Tart off the board. I'm so glad that I decided to squeeze in a pudding because it was delicious. 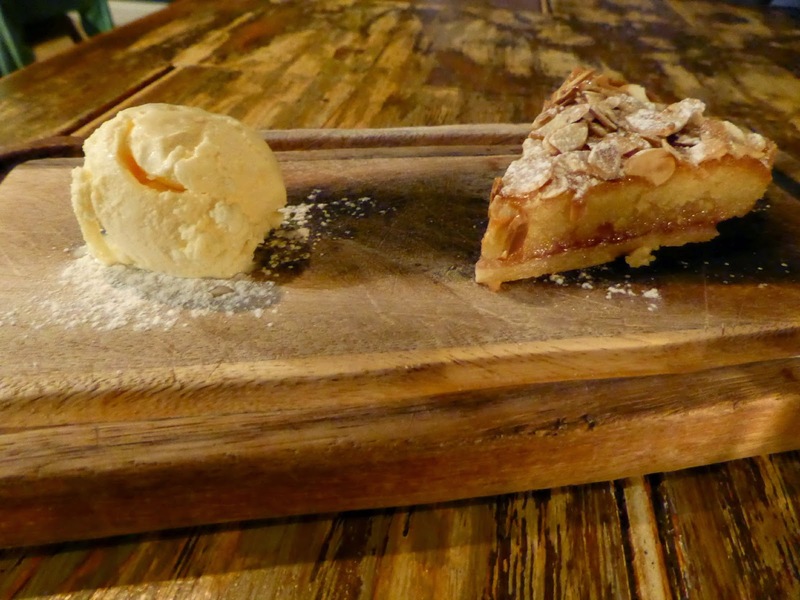 Covered in almonds, it was quite similar to a Bakewell Tart which I'm a huge fan of. It was one of the nicest desserts I've had in a long time. I am very glad that we finally got ourselves to Jam Jar, the food was lovely and we will definitely make sure we return. I have my eye on the rather tasty looking brunch menu. 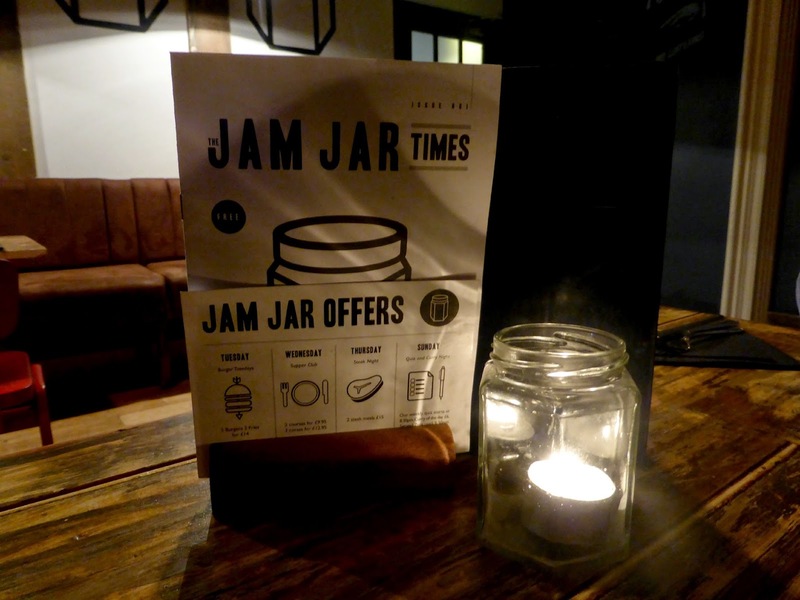 We were invited to dine at Jam Jar and our meals and drinks were complimentary. As always this review is my honest opinion. Yes it was really moist! I know what you mean - when pulled pork is done right it's AMAZING but when it's wrong it is awful! I love ticking places off my bucket list! Me too, I get a real feeling of satisfaction doing it! Ooooo don't suppose you noticed what their veggie options were like did you? My sister is at Northumbria uni now, so I am planning a trip your way very soon! 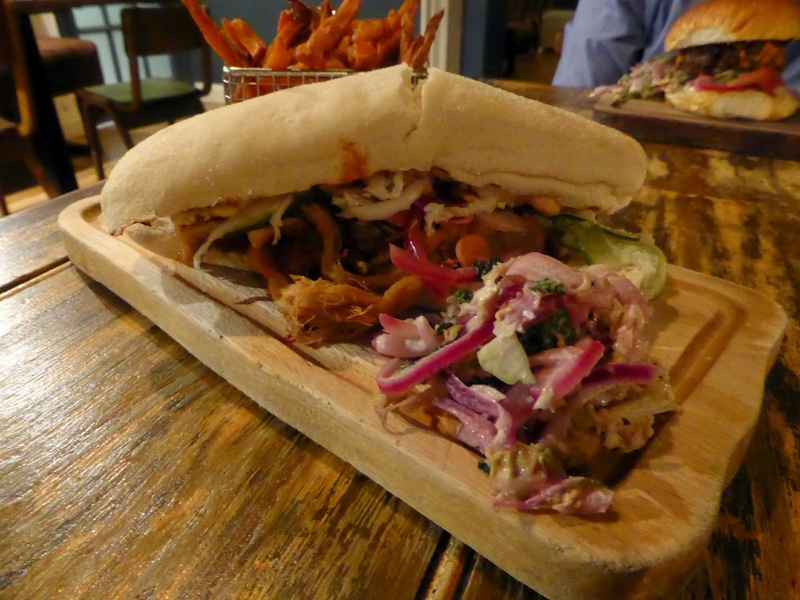 Most of the menu does seem to be made up of meat, they do have a few veggie things on the menu though - the rather lovely sounding Halloumi and Sweet Baby Pepper sandwich is right up my street! I quite often pick veggie dishes! I am so hungry right now and this looks amazing! Richie and I were going to go there last week for dinner but we went to the 'all american burger co' inside Spy bar instead. Definitely on my to-do list though! This looks so lovely! 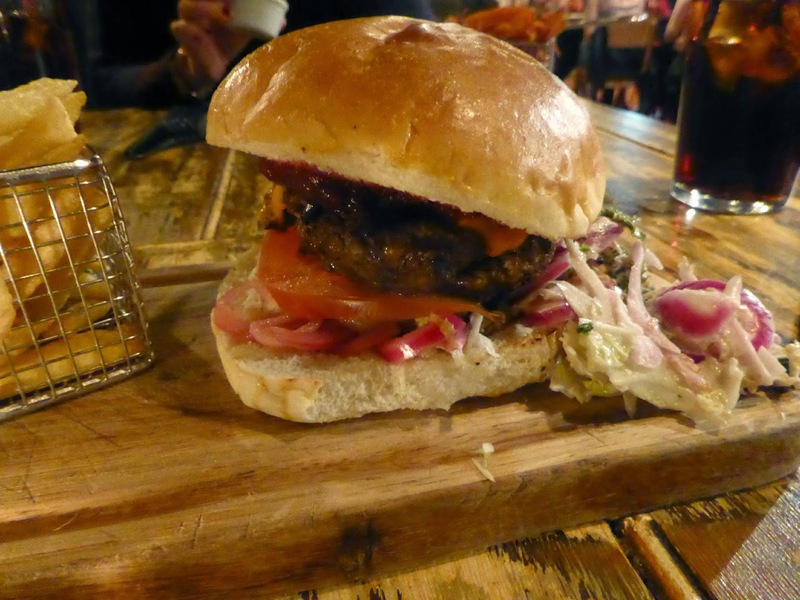 I love how it's presented on the wooden boards too. I love getting burgers etc but they're so awkward to eat when they're fully loaded! Looks so tasty- definitely going to have to get myself there! You eat at the best places! I neeeed to eat out more often haha. This place looks amazing! Thanks for your sharing your review, I'll definitely be adding it to my list too! I really wanted to go here before we moved, but we didn't get the chance! Another one for the list! The food looks amazing!